Takeaway: Lord Shiva is the Destroyer, the god who removes whatever no longer serves a higher purpose in our lives. Often the reference GOD is given to the main Hindu gods. G = Governor, O = Operator, and D = Destroyer. The Governor is Lord Brahma, the creator of the universe. The Operator is Lord Vishnu, as he is the preserver of the universe and the epitome of dharma. The Destroyer is Lord Shiva, who removes whatever no longer serves a higher purpose in our lives. When it comes to religion, most Indians usually fall into one of two categories. Those who worship Shiva or those who worship Vishnu and his incarnations. The former group are known as Shaivites (shaay-vItes with a long i). Due to a curse placed on Lord Brahma, he has very few temples devoted to him. While Brahma is revered, he is not a deity who is regularly worshiped. Shiva is translated as “the auspicious one." He has many appellations including Rudra, Mahadeva, Mahesh, Kailas, Umapati, and Nilakantha. Shiva is the husband of goddess Parvati(Par-vuh-tee). They are the parents of Ganesha (the elephant headed god) and Skanda (the leader of the celestial army). Shiva inhabits Mt. Kailash, where he spends hundreds of years immersed in meditation. He is an ascetic and very interested in spiritual pursuits rather than worldly matters. Lord Shiva is typically depicted sitting in meditation on a tiger skin rug with his eyes closed and his chin slightly tucked. He has matted black hair with a bun on top of his head. He wears a snake around his neck and has a crescent moon on his forehead. The Snake represents the ego, which can be tamed and then worn as an adornment on one's body. It also symbolizes the kundalini shakti (koon-duh-lee-nee shuck-tee) or the spiritual energy. The snake’s head points downwards. This represents that the ego should be directed towards the consciousness and not outwards. Many Shaivite traditions harness the kundalini energy as part of their spiritual practice. Shiva is pictured with a crescent moon on his forehead. The moon is the ruler of the nights and the Vedic calendar is a lunar based system. The moon symbolizes that Shiva is the master of time, and that he himself is timeless. 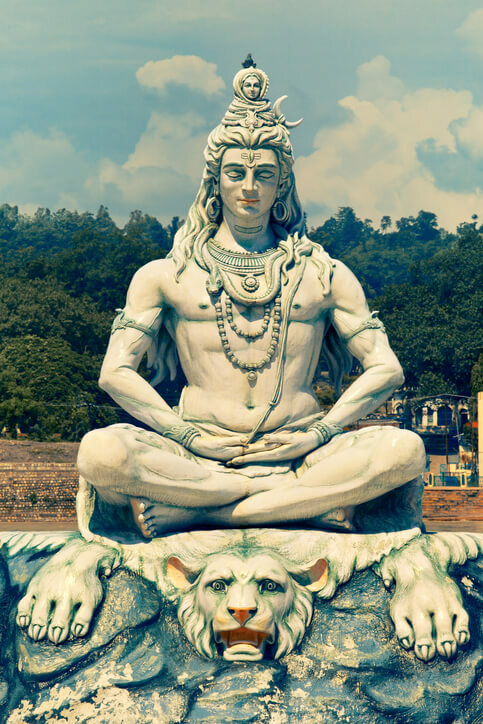 Given the association with the Moon, Shiva is the deity associated with Mondays in Vedic astrology. Shiva has a tilak (tee-luck) or a round dot of red vermillion powder in the middle of his forehead in the space between his eyebrows. This is his Ajna chakra (Ujj-nya chuck-ruh) or third eye. It reflects that his inner awareness is open and that he is attuned to levels of higher consciousness. Shiva is depicted with ashes or bhasma (bhus-mah) all over his body. As the destroyer, Shiva is the deity worshipped when souls leave their body. Due to his visits to the cremation ground and proximity to the burning funeral pyres, his body is covered with ashes, which denotes his indifference to worldly life and social conformity. Shiva wears a rudraksha (roo-druck-shah) mala around his neck. These brown beads are said to be formed from the tears of Shiva. They are a symbol of protection. Many drawings or statues show Shiva holding a rudraksha japa mala in his right hand. This reflects his great power of concentration. It also signifies that he is above all three states: waking, dreaming, and sleeping, but that he can uphold all three simultaneously. The trishul may also be seen as representative of three states of action: self-induced, other-induced, or divinely induced. Shiva is shown with a drum or damaru (dum-uh-roo). The sound emanating from the drum reflects the sacred sounds from the mantras and hymns of the Vedas - the most ancient Indian texts. The damaru also symbolizes that the universe is continually expanding and contracting. This is all part of Shiva’s cosmic dance, the Tandava. Shiva’s vehicle is his bull, Nandi (nun-dee). Nandi is a symbol of righteousness or following the right path. The river Ganga (Gung-ahh) is flowing from atop Shiva’s head. This represents the endless flow of divine knowledge. Additionally, the Ganga is a descent of the Mother goddess into the mind and body as well as the liberation of the embodied soul (moksha). The most sacred night of the year to worship Lord Shiva is on Maha Shivaratri (the great night of Shiva). Given that it is a lunar based festival, it falls on varying dates each year, according to the lunar calendar. It typically is in late January, February or early March. Get a statue of Shiva or a framed photo and place it on your altar. Offer white flowers to him. Use a rudraksha mala for japa repetition. Pray for his guidance in your life.